can control allowed applications by an encrypted file, which can send anyone to use it. Allowed application controlled by registry settings. Several applications can be configure at one go. The application is running as service automatic after you turn on the computer and before any user is logged in. Interaction between user and program isn't possible. Allowed applications and credentials controlled by an encrypted file or clear text. Logon as . . . .
another user Run application under user account from encrypted file. This can be an administrator or any other user account. system Run application under system account with highest privileges and without the popup of an UAC dialog. Suitable for installations, updates and patches. Disadvantage: A service is not a complete account. Its missing a user profile and an own HKU registry path. administrator Launch application with administrator permissions under the own fully account of the limited user with his own profile and enviroment. To create an encrypted file. or drag and drop the encrypted file over runasrob.exe. To set folders, its applications can be launch with administrator rights or allow only a specific application. 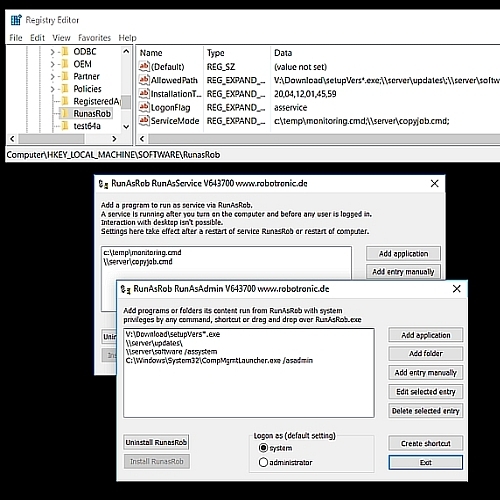 Install runasrob with option /allowedpath, followed by the allowed folders or applications. Semicolon separated to allow more than one folder or application. This can be done by command line, batch file, shortcut or any other way. An advanced optional switch are /assystem or /asadmin. /assystem -> The allowed application is running under service account with elevated admin rights. /asadmin -> After the user enter his credentials he will be member of the local administrator group for this application which is running under his own account. runasspc.exe /cryptfile:"crypt.spc" /program:"C:\WINDOWS\system32\calc.exe" /domain:"localhost" /user:"administrator" /password:"password"
Here you configure the values AllowedPath, ServiceMode, LogonFlag directly or over central group policy in a domain. Warning, serious problems might occur if you change the registry incorrectly. Running on Windows 10 Professional and Home, Windows Server 2019. 64 Bit and 32 Bit Version included. which appears at random intervals, even if you set the switch /quiet. Wildcards can set as authorized path. Example: >> *\updates\flashplayerversion*.exe <<. This can be achieved over folder permissions to the program file, encrypted file or the folder. Program arguments are working. If passing arguments are not working, because quotation marks or complex arguments are not accepted in RunasRob. Workaround of this problem is a one line batch file with your complete applicaton call include all arguments. Run this one line batch file over RunasRob. Most errors are system errors which are returned from runasrob to user.